Last week I prepared a full-scale cocido madrileño, meant to serve six. 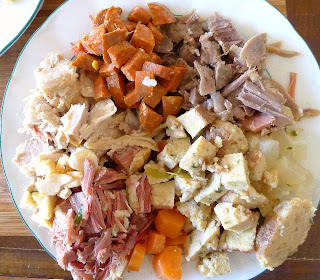 As it happened, we were only three at table, so I’ve got lots of leftovers from that boiled dinner. 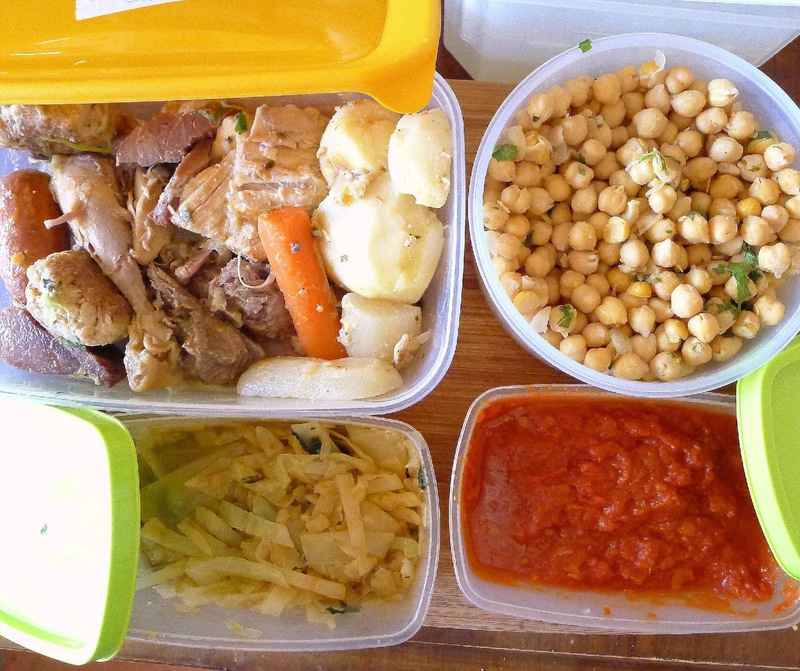 Leftovers are cause for pleasant anticipation, as they mean several days worth of meals, ready and waiting. I intentionally cook double the quantity of chickpeas required, so that I will have some to freeze for future use—hummus, salads, a potaje of spinach with garbanzos that can be put together in 20 minutes. I used most of the leftover cooked cabbage in this gratin recipe from the New York Times. Leftovers from the cocido: boiled chicken, beef, pork and ham; potatoes and vegetables, chickpeas, tomato sauce plus a pot of flavorful broth. The leftover soup with fideo noodles, with the addition of cooked chicken and carrots, disappeared for lunch the next day. Remaining is a pot of caldo, the deeply flavorful broth from the cocido pot. It’s the starting point for a different soup. 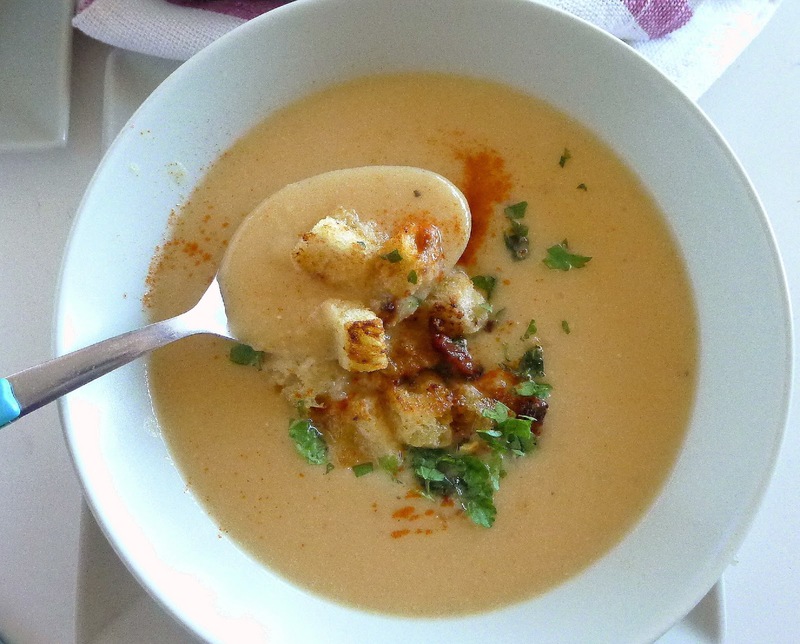 Soup with cooked chickpeas and broth from the cocido, topped with crisp croutons. 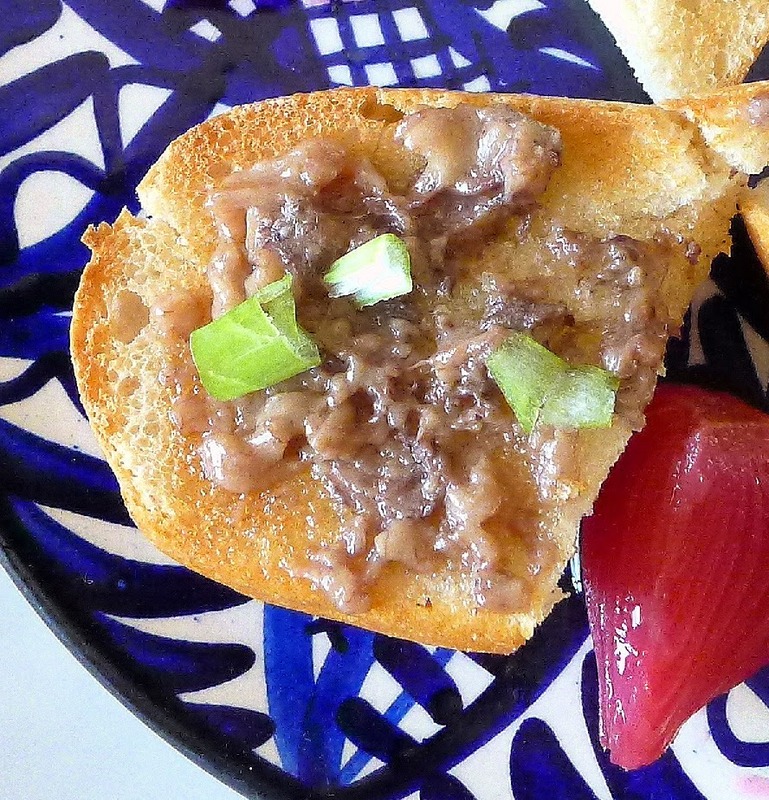 The bone marrow, reheated and spread on toast, makes a small snack while I work on chopping up the other leftovers. I’ve got the remains of stewing hen, beef shin, pork belly, ham, chorizo and morcilla sausages. 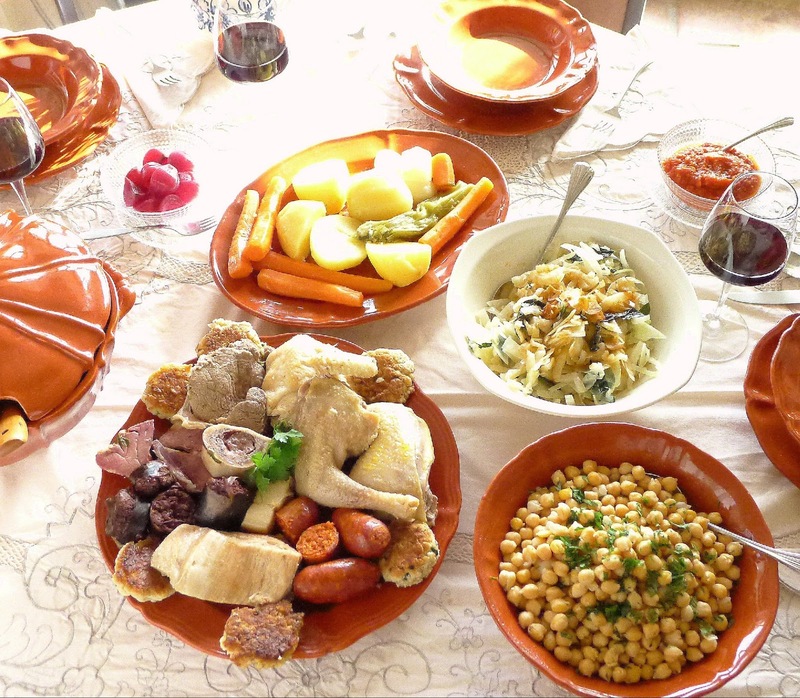 Plus, potatoes, turnips, carrots, cabbage chickpeas and relleno, the “dumplings” from the cocido. Sounds like hash to me! 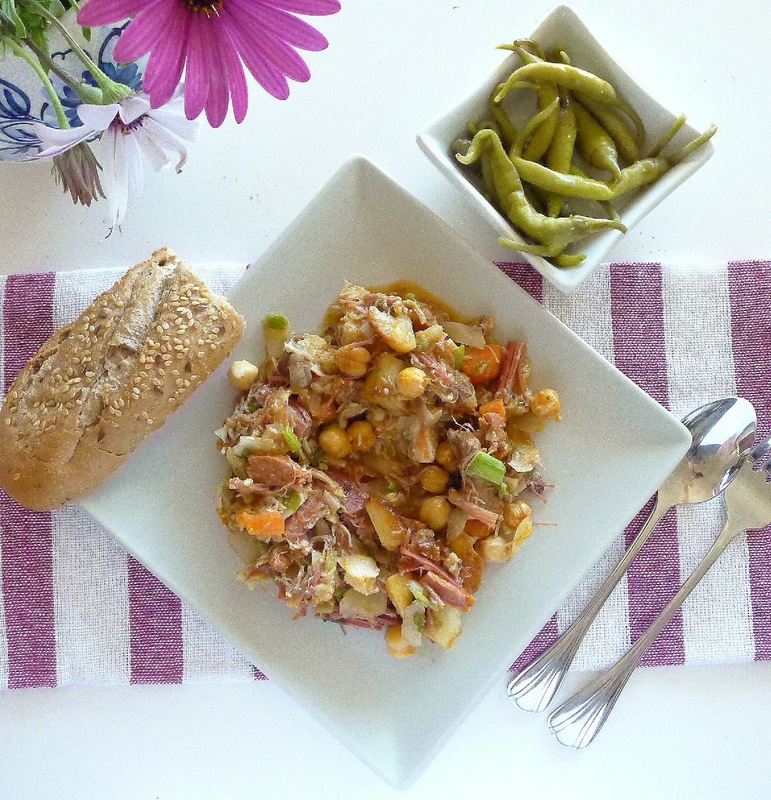 In Spain, the classic hash is called ropa vieja—old clothes. 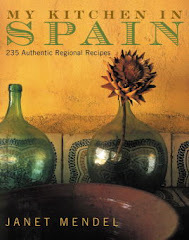 Frankly, I think boiled serrano ham is more like old shoes, but the other ingredients make for a savory hash. 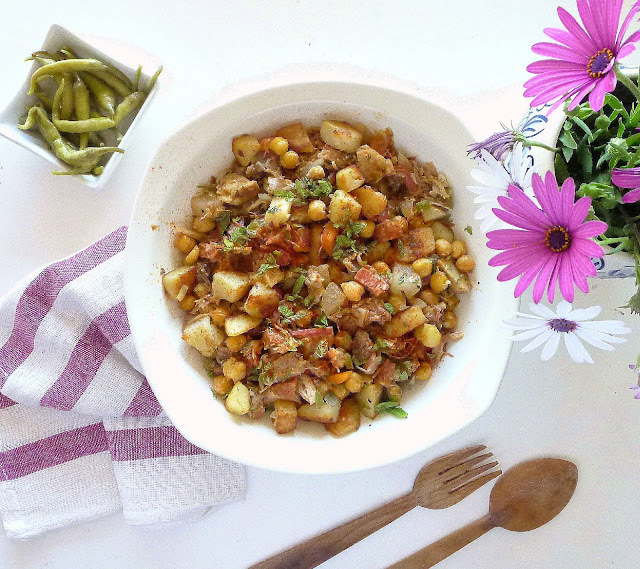 Raggedy "old clothes"--a classic hash to make with leftover cocido. Mild green chilies go with the hash. Top the hash with a poached egg and call it "brunch." 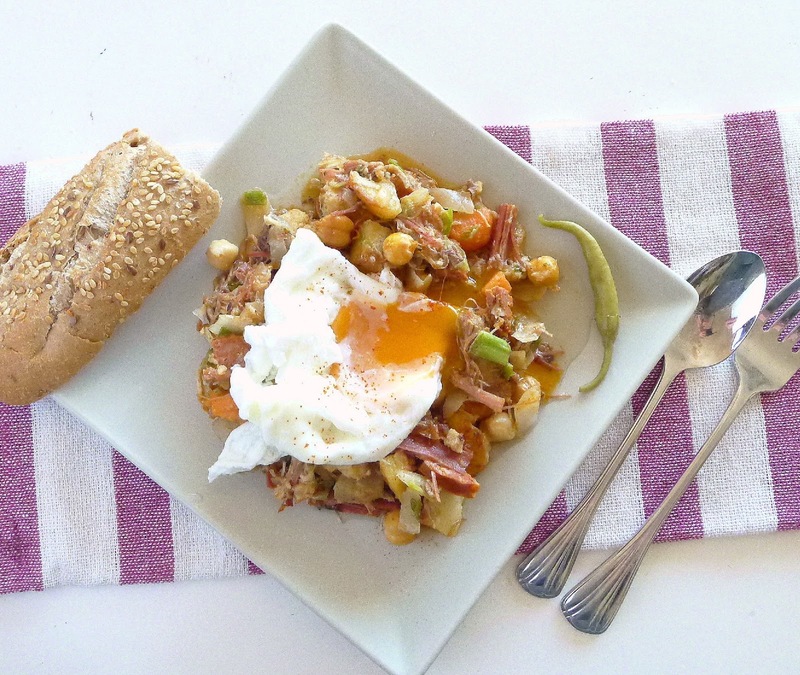 Use any combination of cooked vegetables and meats, sausages and chickpeas for this hash. Fry the diced potatoes first and set them aside. Stir them into the hash right before serving. The hash should be juicy, not soupy, not too dry. 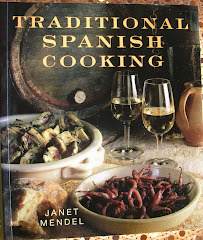 Add wine, caldo or water to the hash as it cooks. 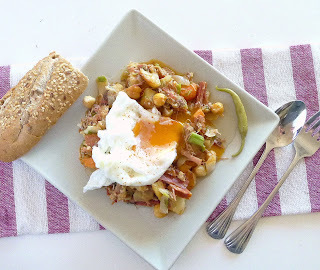 Serve the hash with bread as a main course. Top it with poached eggs and call it brunch. Wrap the hash in warmed corn tortillas with some sliced jalapeños. 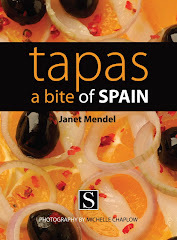 Use it as filling for empanada. Mix it with beaten egg and make patties; dip them in flour, beaten egg and bread crumbs and fry them. Diced beef, ham, pork, chicken, sausage and vegetables. Heat the oil in a skillet and brown the diced potatoes. Remove them and set aside. Add the chopped onions and garlic to the pan and sauté until onion is softened, 5 minutes. Add the chickpeas and diced meats and vegetables. Sauté on a high heat for a few minutes. Add the tomato sauce, Sherry, broth, pepper, salt if needed, thyme and green peppercorns, if desired. Simmer 15 minutes. Return the potatoes to the hash. Serve the hash garnished with chopped parsley. Crispy croutons accent the smooth chickpea puree. This puree, with chickpeas, carrots and potatoes, is best made with the leftovers of a grand cocido. 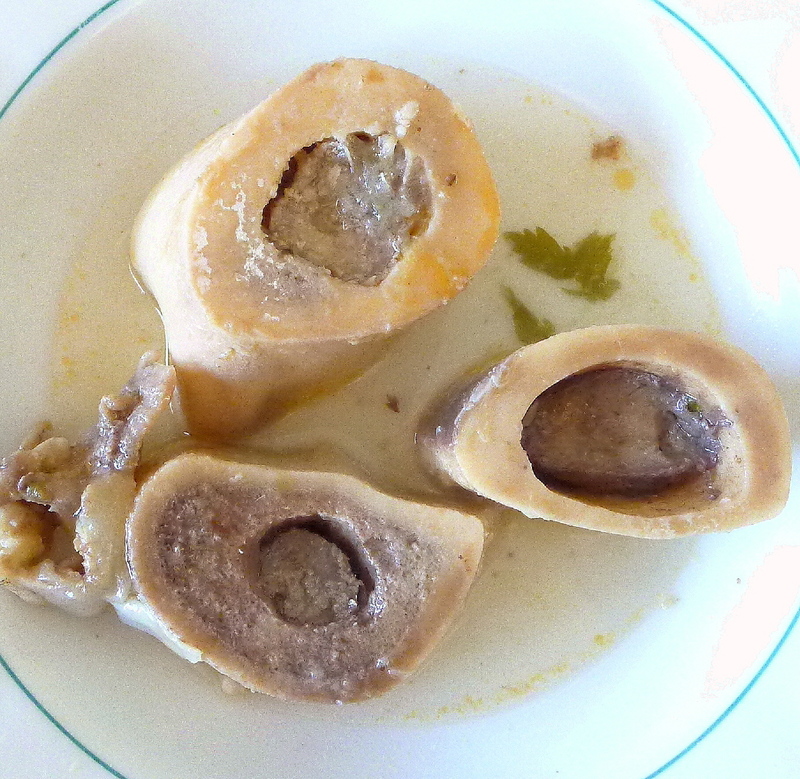 The cocido provides caldo, a full-flavored broth from slow cooking chicken, beef, and ham bone. If you are starting with uncooked ingredients, you will need about 1 ¼ cups dry chickpeas to make 3 cups cooked. Soak them in water for 8 hours. Put them to cook in boiling water and simmer until tender, about 2 hours. If you want to approximate the flavor of the cocido broth, use a piece of (unsmoked) ham bone or pork hock and chicken broth to cook the chickpeas. 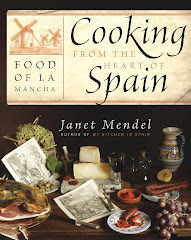 If using broth from the cocido, sieve it and, after chilling, remove the fat that rises to the top. For a vegetarian version, use water or vegetable stock and skip the salt pork or bacon in the first step. 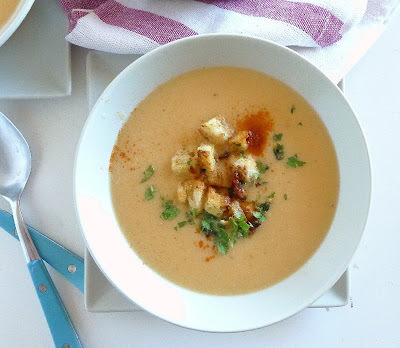 Use cooked chickpeas for soup. Heat 2 tablespoons of oil in a soup pot. Fry the salt pork or bacon until fat is rendered and pork is crisp, 2 minutes. Remove the pot from heat and tip the pot so fat drains to one side. Skim out the salt pork or bacon and reserve. Return the pot to the heat and add the carrot, onion, and garlic. Sauté on medium heat until softened, 4 minutes. Add the potato and cook 1 minute. 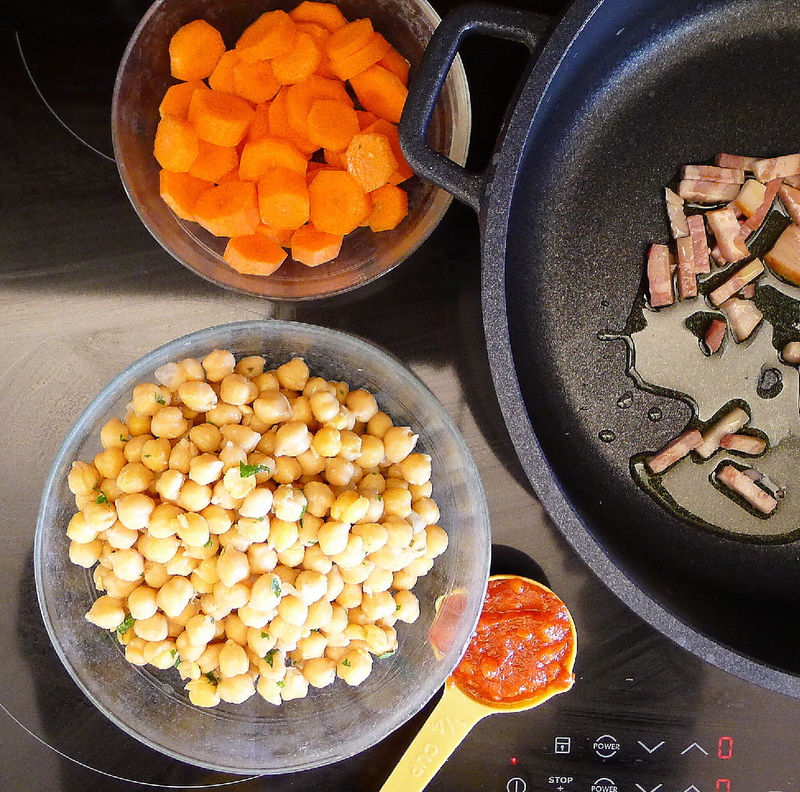 Add the chickpeas, tomato puree, and water, broth, or chickpea cooking liquid. Season with cayenne, cumin, salt, pepper, thyme, and bay leaf. Bring to a boil, cover, and simmer until potatoes and carrots are tender, 30 minutes. Discard bay leaf. Puree the soup in batches in a blender. If desired, sieve the puree. Shortly before serving, reheat the pureed soup. 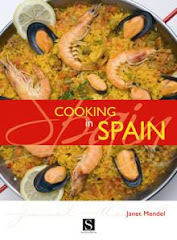 In a small skillet, heat 1 ½ tablespoons of oil. Toss the diced bread in the oil until lightly toasted, 2 minutes. Add the chopped garlic and the reserved salt pork or bacon. Fry 1 minute. Stir in the chopped parsley. Serve the soup in bowls. 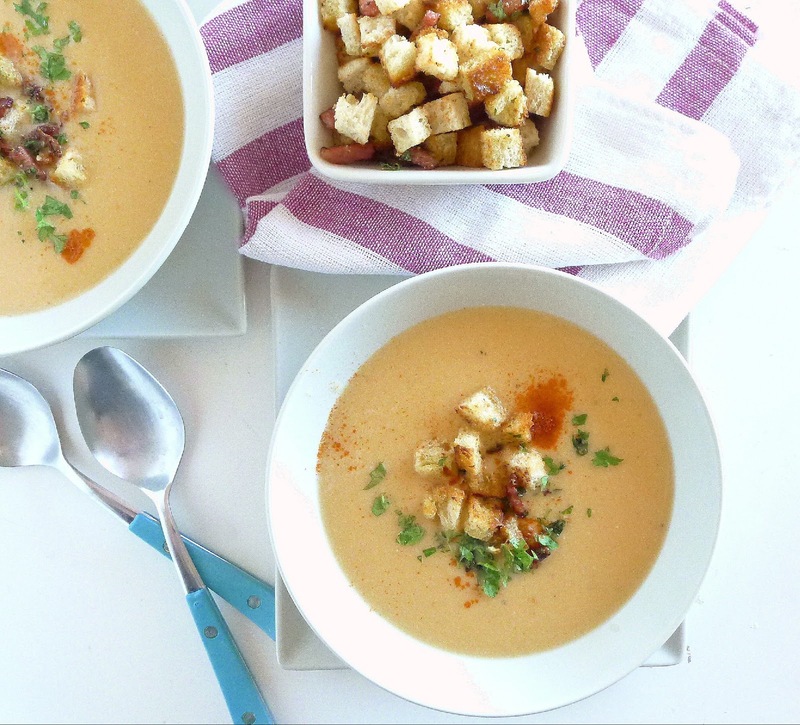 Scatter the croutons, garlic, and salt pork over the soup. 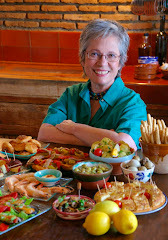 Top each serving with a pinch of pimentón. Potaje of chickpeas and spinach with dumplings. Empanada. (use ropa vieja instead of tuna). Cocido in its first iteration.